All rooms come with free WiFi, air-conditioning, TV, balcony or terrace with outdoor furniture, a minibar, room service, and a desk and/or sofa. The en-suite bathroom contains a bath and shower, plus a hairdryer. Safes are available for an extra fee, and the daily maid service keeps rooms fresh all week. Towel changes are available on request, as are baby’s cots. Exactly the same as double rooms, if you’re travelling by yourself or your party has an odd number of guests, a double room for single use is a great option. Giving you all the space of a double room to yourself, you’ll have a double or twin beds in 29m2 of space. Sitting on Lanzarote’s east coast, Costa Teguise is a humble hotspot for all sorts of holidaymakers. Fringed with an idyllic promenade offering perfect strolling opportunities, there’s no excuse not to make the most of the area’s five gorgeous Blue Flag beaches. Each with powder-soft sand, gently sloping into the clearest of seas, it’s no wonder why visitors spend the whole week on the coast. Whether ‘nightlife’ for you means warmly lit ocean-front restaurants, trendy bars serving refreshing cocktails or neon-lit clubs playing all the latest club classics, your evenings won’t be going to waste in Costa Teguise. This is a place that welcomes all, be it day or night. 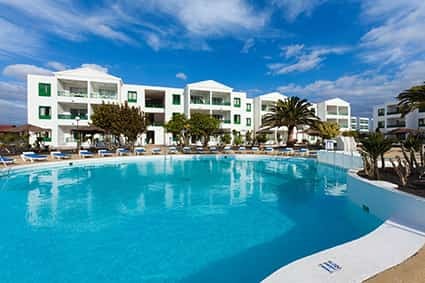 For those with an urge to explore the best of Lanzarote, Costa Teguise is ideally located for venturing out. With a golf course and water park just a short walk or drive away, plus the must-see Timanfaya National Park only 30 minutes’ drive from the Blue Sea Costa Bastian, there’s enough to be discovered outside of the hotel during your stay. Beach lovers can enjoy the sand between their toes at Las Chucharas beach (free transport from the hotel for All Inclusive guests).